can't tell you how much I love this - the texture and the tones...and those numbers...I had a pair of jeans to toss...not now! This is so creative and fun. I love the design. 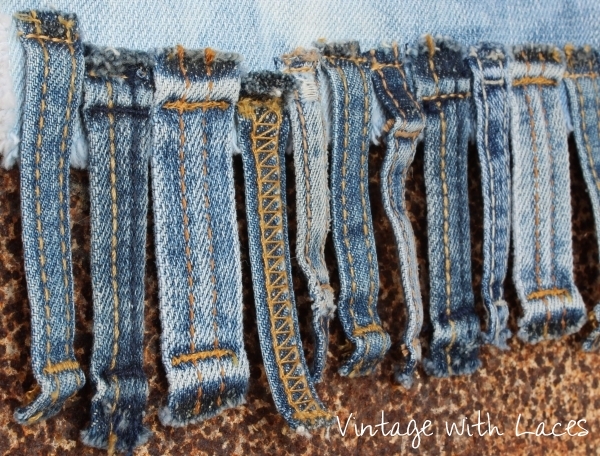 What a great way to give new life to a pair of old jeans. Beautiful. Happy Friday have a great week end. So fabulous! and you are very talented and I love to see what you make and it is neat that you are recycling old garments and giving them new life. I have made tote bags out of old denim jeans. das sieht wunderschön aus, ich mag das sehr. WOW! 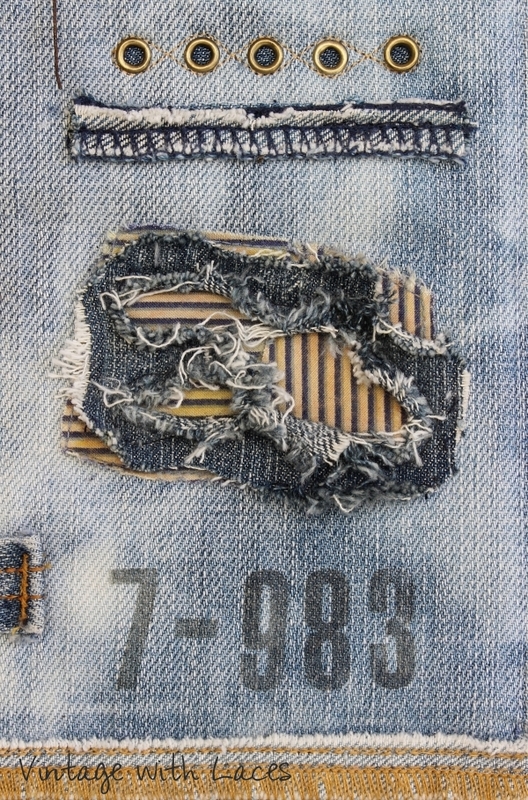 The denim, the rusty stuff, the color, the texture...I love the combination. What a beautiful and unique creation! your collage is wonderful, and so creative done.You have always new ideas, and brings them to life so beautifully. 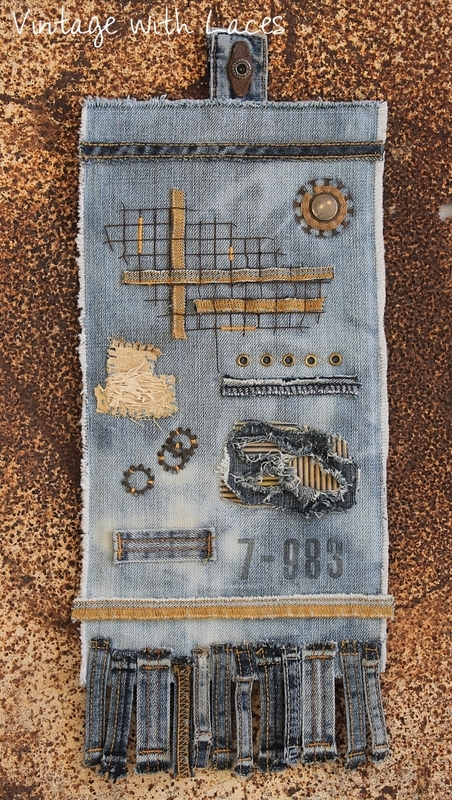 I love the hanger, with the fringes, and patches,also the numbers stamped ,looks great with the rusty mesh .It is a fantastic detail that you sewed in on ,with the sewing mashine, Julia. So inspirering to visit you always, dear friend. I hope you are well, and fine !! es ist wirklich gut, dass du inzwischen ALLES von den alten Jeans aufhebst, denn du bist wirlich die perfekte Resteverwerterin. Wo andere nur noch kaputte Klamotte sehen, kreierst du Kunst. 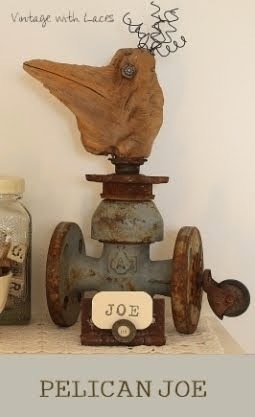 Dein Wandschmuck ist mal wieder ein außergewöhnliches Stück - und weißt du was, ich bin überzeugt davon, es gäbe viele (inklusive Frau Rostrose, die gern Jeans mit solchen Verzierungen tragen würden, wie du sie auf deiner Schöpfung angebracht hast. Oder zumindest Jeanstaschen! Danke auch für deine Kommentare zum Palmölthema und zum Gudrunkleid! Wird bei euch denn auch schon so viel Palmöl verwendet? Ich finde es gerade in südlichen Ländern, wo wohl auch andere Ölpflanzen gut wachsen, umso perverser, wenn dann aus SO-Asien dieses Umweltzerstörungsöl importiert wird... Ja, und was das Kleid betrifft, gebe ich dir recht, mir gefällt es auch mit der Jacke besser. Es soll eigentlich ein Sommerkleid sein, aber ich denke, ich werde es überwiegend in der Übergangszeit tragen - mit drüber und drunter, da steht es mir einfach am besten. Ich lasse dir herzliche Grüße da und schicke weiche Fellchenkrauler mit! Echt cool, was man aus alten Jeans machen kann. Deine Collage sieht toll aus Julia...der Draht, die Zahnräder, die Nieten, der Zahlenstempel...es passt einfach alles perfekt zusammen. Ein echter Hingucker! This is incredibly cool Julia and such a rare talent. 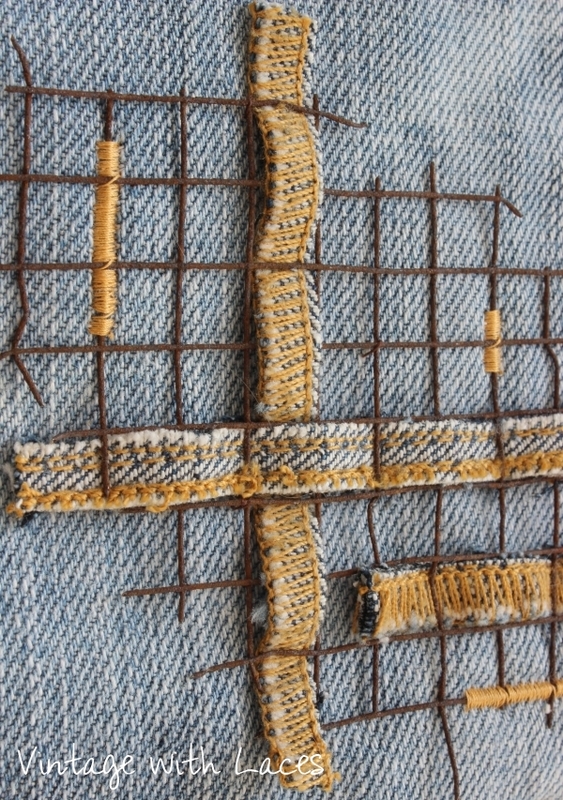 You are creating art using leftover pieces from the jeans. I love the play of colors, and patterns you have used even the difference in the sewing seams tells a story. This is quite brilliant. Thank you so much for sharing this with us over at Sweet Inspiration. I am going to pin, share and tweet. Goodness gracious! This is yet another amazing piece you have created. Always you are so clever and the end result is amazing! danke für deine lieben Kommentare! Dir geht's gut, wenn du auf dem Weg zum Supermarkt, Schafe, Ziegen & Co. siehst. Ich seh da nur Häuser und Autos und mit ein bisserl Glück Leute mit einem netten Hund. Meine Katzen bedanken sich für die Bauchkrauler mit Pfötchenwinkern - und ich schicke dir hier ebenfalls weiche Fellchenkrauler mit! Hab noch ein schönes restlichen Wochenende! eine tolle Idee,aus Jeans-Resten eine Tasche zu fertigen. Schaut super aus, ganz toll! I like denim too. Really love how you have used the tags from the waistbands - this is cool. 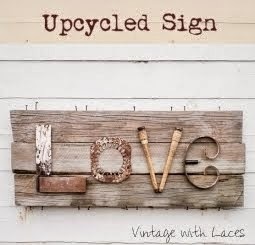 Such a creative project and a useful way to upcycle! When I was a teenager, not one pair of jeans went to waste. I used to make shoulder bags after cutting off the leg part of the "dungarees" (sp?). Two pockets sewn together made for a decent, grungy wallet, which was attached to one of the belt loops in the corner and hung from the jeans I was wearing. BTW, I was the turned-around belt loop in your "fringe loops" as a teen, lol. Love your style and inspirational thought process! Really enjoying going back in time and discovering all your wonderfully creative ideas! I, too, love blue and orange; it reminds me of a beautiful sunset: blazing sun against indigo skies. Your denim quilt has a very interesting design. And yes, those belt loops certainly do make an artsy fringe!